Discussion in 'Repros' started by Persimmon, Feb 8, 2010. I am thinking about buying this jacket -ELC WERBER - Contract 1729 from Eastman. Does anyone have this jacket. How is the sizing ? What are your opinions of the jacket, the fit and style. I owned one of the first a few years back, it is a superb and pretty unique A-2 being a so early contract. 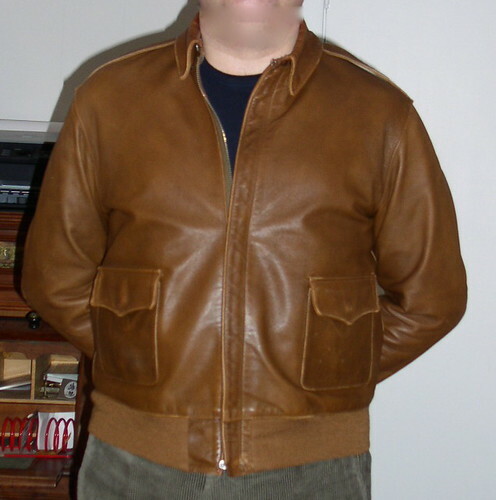 It is important to take into account the tight fit of this jacket and I would always recommend going one size up from your usual, I wear a 42 but actually needed a 44 in this model. The 'Hookless' zip took a bit of getting used to due to its unique fastening but no problem. 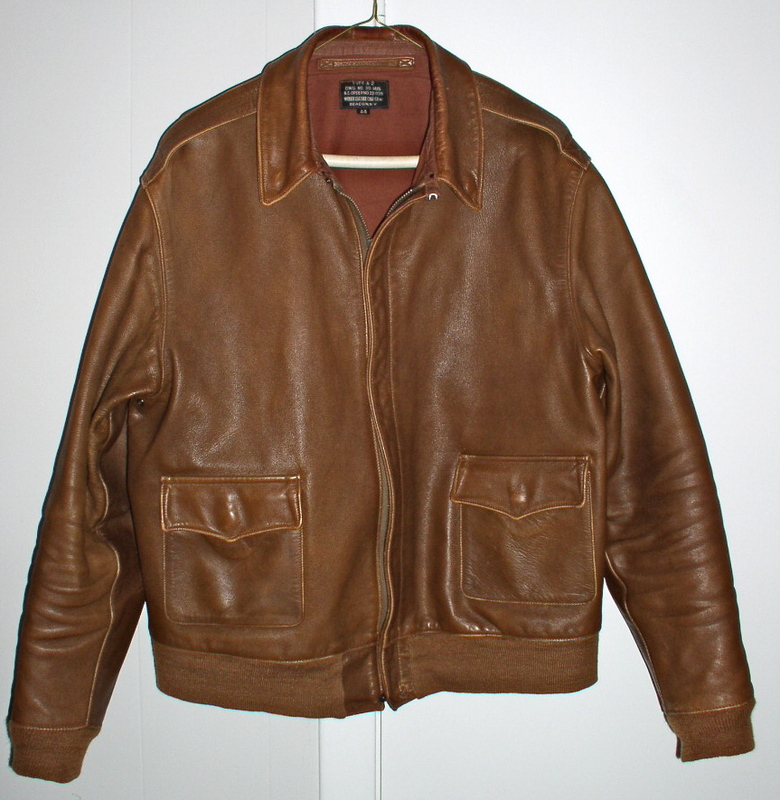 Last year at the Duxford show I saw an example with the 'time-worn' finish and it really looked like a true vintage jacket, that is an additional option of course. As for if 'there's something better', as far as I know ELC are the only makers of this first Werber contract, many here will point you to a GW but that is a later Werber. I concur with Paul on basically all points. I got my 1729 used from a fellow VLJ'er, in my usual size 44, and "outgrew" it within a year. I've since done a few hot-water stretches, so it's comfortable, but it looks tight and short on me - especially thru the shoulders and sleeves. It's cut lean in those places, and there is little or no blousing in the waist. I'm 5'11", 190#, so would probably have done better with a 46, and would encourage you to buy a size larger than usual, too. The jacket has aged nicely with wear, and the hot soaks didn't hurt, either. The dye color is unique, a very light russet that is closer to "tobacco" in shade (for both hide and knits!). My example didn't have much grain, and what has come up is rather fine, but the seams lighten up quickly and the whole thing has a nice broken-in feel and look. Be prepared for the Hookless zipper to give some problems. I had to crimp the slider to keep it fastening properly, and the pull has come off twice. The left zipper rivet has cracked and lost its cover plate, tho the fastening is still secure. What do I think of the style? I think it "is what it it is." It's boxy and spare, even when it fits well, but classic and simple. I definitely want one in "my" size one day. Here's a look at a typical 1729 user in the mid '30s. I used to own one last year. I wear a size 40 and I ordered a size 40 at ELC. After all it was too snug and tight on me, so I sold it to a fellow VLJ member. The jacket is great in every way. A bit light weight but incredible nice and grainy leather. Also liked the Hookless zipper. I can recommend you this jacket but if you wear a size 38, you better order one size up. BTW, the Cable Raincoat goatskin is also very lovely and is true to it's size. It's a slim jacket for sure but that's why I like it. The sleeves are heavily tapered also which creases up the sleeves in no time. I ordered my usual size 44 (my chest is just shy of 44 inches) and the fit is very good. With a thin sweater underneath the jacket moves well with my body and arms. As zoomer mentioned, the color is very unusual for an A-2. It develops a nice worn-in look quickly. Also, it does have a high collar-stand which may not be to everyone's liking but is comfortable on me. If you decide to get one, you won't be disappointed. As for if 'there's something better', as far as I know ELC are the only makers of this first Werber contract, many here will point you to a GW but that is a later Werber. The Few also make the '33 Werber, usually in a light russet HH ... here's Bevan's example in dark seal. I can't really add much to what has been said except to say my size 42 is a good fit on me (I have a 38 chest, but with a long upper body) and is a much better fit than the size 40 I used to own several years ago. The weak point is the zipper and the puller broke off my first Werber, but Gary sent me a replacement. It is one of my favourite ELC A2s, perhaps because it is so different from most A2s you see around. A 40 I think it is. What was the length like. You don't remember how long it was. I know its a while but you never know. I Guess I have an normal upper body and the size 40 was good in length, Maybe for others a little bit short but I am used to wear short jackets. If I had only ordered a size 42 in the first place. I am sure it had been my all day wear A-2 jacket. Who knows what the future might bring. Hopefully, a stronger greenback. I, for one, can't quite justify a brand new Eastman till then. I have one of the first batch jackets from 2007 (Lot 0012) and it's my favorite ELC A-2 by far. The torso has a longer fit than the usual A-2. I usually wear a size 40 in most A-2's but this one I ordered one size up, thank God I did. Here’s a picture of my ELC Werber 33-1729 that I purchased around a dozen years ago and have simply worn. The dimensions look close to the original in Mr. Eastman’s book, also a 44”, and I’ve noticed the dimensions currently listed by HPA are quite different to mine (I’ve heard they made some revisions over the years, but I do not have the details). Since it’s not on the Eastman Leather site I’m not certain they make the Werber 33-1729 anymore, but I do think they got this quite close to the original and with very similar fading too. Brent, Lebowski, D97x7 and 4 others like this. I purchased Werber 1729 ten years ago directly from ELC, it took me only 499 £ at that time, how time changed. The pattern is a little bit snug, its horsehide is lighter than my RW27752. AIUI, the Werber and HLB jackets (their preWW2 repros) were both made by just one operator. This person left ELC. They supposedly will be training another op, but have removed both jackets from the catalog for now. 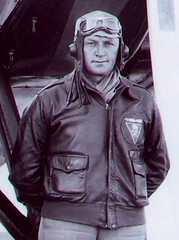 The jacket looks very similar to wartime original A-2 from late 30s-early 40s! 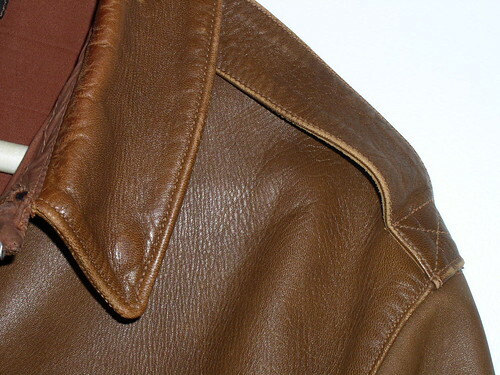 That's one of the best Eastman's repro and lots of wear makes the jacket looking even more authentic than new. Checked the original paperwork and I purchased directly from Eastman on 31/3/09, so ten years tomorrow (didn’t see for sale elsewhere at the time). My early 44” is a bit smaller than the last measurements I saw on History Preservation Associates. Probably more for a shorter 5'7"-ish person from the 1930's versus today. I really like the denim-like honeycomb on the sleeves too. Lebowski and B-Man2 like this. Mine’s 078 and it’s a keeper. I had one of the earlier ELC Werbers, made about 10 years ago . The horsehide was thin and unremarkable . No matter how much I wore the jacket and no matter what I did to it , there was no way it would develope any graining. The hide was like thin cardboard , no character. D97x7, Lebowski, Bombing IP and 1 other person like this.